Curb Appeal….those two famous words used by real estate agents everywhere. And the truth is there’s something to be said for a beautiful entranceway. My mind immediately travels to an image of a manicured lawn that showcases a winding front walk leading my eyes to a beautiful front step with cascading blossoms in wrought iron planters on either side of the leaded glass door. A wreath filled with seasonal blooms or greenery typically invades this image…and stone..there is just something about natural stone that lends an instant feeling of strength and timelessness to a home. When thinking of renovating your front entrance…or building a new home, it is very important for you to think about what you find welcoming. Everyone’s style is different, we had one client that always wanted a wooden front porch, one that would eventually creak when you walked on it….and yet many other clients wanted nothing to do with wood….low maintance…that spoke comfort to them, after all the last thing they wanted to do was stain a wood porch every few years! 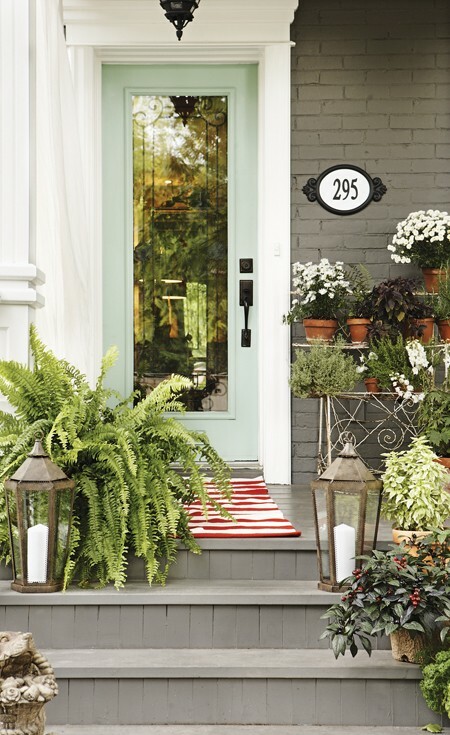 Speaking of front porches the current trend is to have a front porch large enough to put a few chairs and planters on it. A planter that is well-appointed and matches the style of the home makes a huge impact on your guests. Little details like trailing vines and wooden brackets takes the ordinary to the next level. As you begin your project make a list of what you find welcoming in a home. Define the materials: wood, stone, brick, cement. Evaluate what size of porch or entrance way you like. Think about if you would like to have a covered entrance which gives shelter to you and your guests as you come into your front entry. Imagine what kinds of flowers and planters that you enjoy…plan them into your project: after all if you always wanted wooden shutters and window boxes you will need a window! Dream a little about what makes a house a home to you…and incorporate those elements into your design. Be unique and add little touches that show your personal style. This entry was posted in Decorating, Exterior. Bookmark the permalink.